When we think of shrimps, our minds conjure up those familiar orange crustaceans we like to eat as seafood, or the harmless orange tinted marine animal floating in the ocean. However, you will change your mind as soon as you feast your eyes on the Mantis Shrimp. Found in many parts of tropical oceans, including Bali, this crustacean is unlike any shrimp you’ve ever seen. In this article we will give you an insight into one of the most fearsome, yet fascinating marine animals underwater. 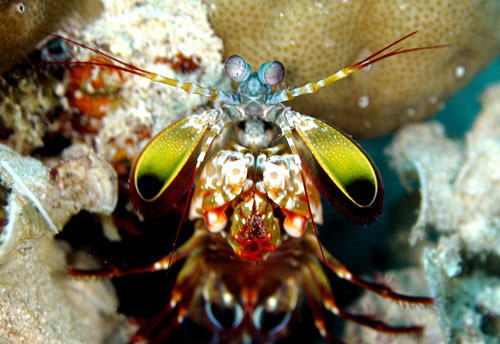 Here are a list of Mantis Shrimp facts for you to keep in mind when scuba diving in Bali! What is the Mantis Shrimp? Contrary to their name, Mantis Shrimps are not actually shrimps nor do they resemble the familiar features of the typical shrimp. Instead they are scientifically known as Stomatopods, who are distant relatives to crabs and lobsters. The Mantis Shrimp is famous for its lightning fast punches with its two appendages called dactyl clubs. They can accelerate their clubs fast enough to briefly vaporize the water around their appendages, and can easily shatter the bones and shells of its preys. There are currently 550 known species of Mantis Shrimps, with sizes ranging from less than an inch long to over a foot in length. They are primarily classified in the way they attack their prey which include two methods one being the bullet-speed punch, or in place of their clubs they are equipped with sharp appendages that act like harpoons to impale their prey. For those scuba diving in Bali you are in for a treat, as many of the dive sites around the waters of Bali are home to these infamous crustaceans. The most common sightings of the Mantis Shrimp occur in Tulamben, Seraya, Nusa Lembongan and also parts of Nusa Penida. Make sure you consult with the diving instructor to guide you to where you can spot them underwater. The Mantis Shrimp has a reputation for being a fearsome hunter, with one of the most sophisticated hunting weapons amongst marina animals. Plan your diving trip so you can observe them in person with our team of veteran divers at Blue Season Bali.